As we have pointed out in previous articles, teenage drivers must pass the written test to get a driving permit in Colorado. The permit then allows you to practice-drive with a licensed adult driver or professional driving instructor. When the time is right (i.e., you have logged the required number of practice hours and held your driver’s permit for at least one year), the permit driver can then proceed to apply for a driver’s license. But what will be on the Colorado driver’s permit test? We have so far covered road signs. In this article, we will tackle intersections. 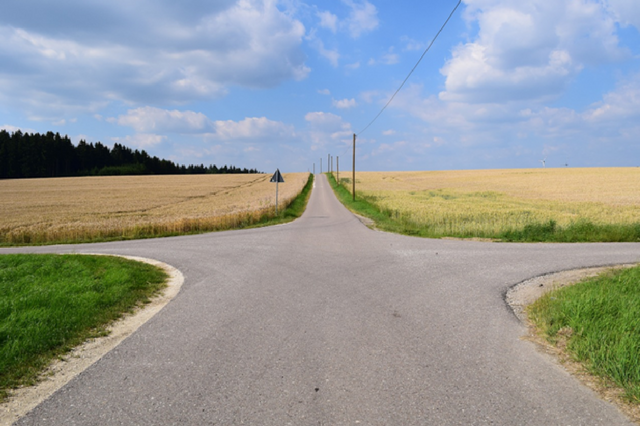 An intersection or junction is a point where two or more roads cross or intersect. There are varied ways to categorize intersections, but one common way is by the number of roads that meet. When three road segments intersect, you have either a T-junction (where two arms create one road) or a Y-junction (also called a fork if you are approaching from the Y’s stem). A 4-way intersection often involves two roads crossing over. The converging streets can be perpendicular to each other or, in other cases, cross at a different angle. 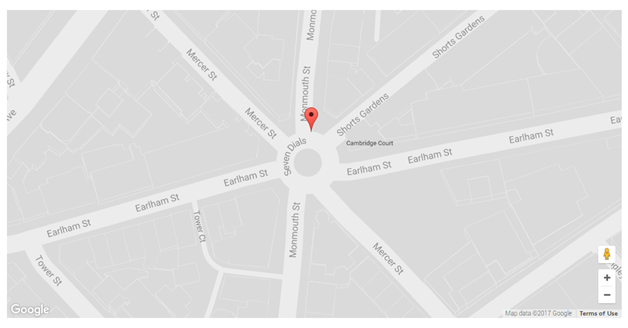 This intersection type is not common but exists in urban areas. An example is the Five Points in Atlanta, Georgia. A 6-way intersection involves the convergence of three roads. Seven or more roads intersecting are rare. An example is the Seven Dials in London. Traffic signals are usually situated at intersections and tell drivers when to stop or go (also called controlled intersections). From top to bottom, the lights are red, yellow, and green. Steady red light: A steady red light means to stop until the green one appears. Turning right is legal after stopping and yielding to crossing pedestrians and other traffic, as long as no other signs prohibiting the right turn exists. Steady yellow light. This signals that the red light is ready to appear and means for drivers to stop unless already at the intersection. Steady green light. A steady green light means you can go straight through, or make a left/right turn as long as the turn is not prohibited by a sign. 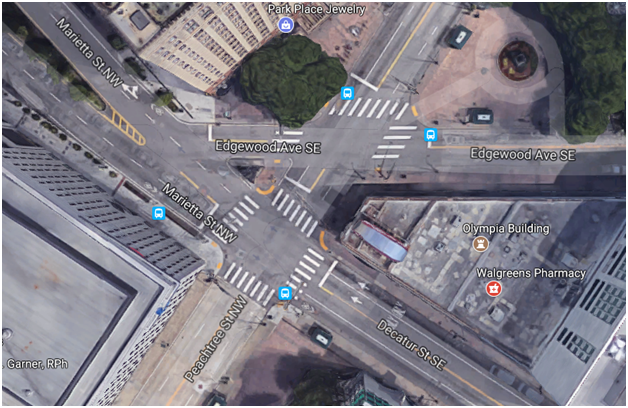 But before executing that turn, yield to crossing pedestrians or any vehicle within the intersection. Flashing red light. This is similar to a stop sign. Stop, yield to pedestrians and other traffic, then proceed when safe. Flashing yellow light. This signals there is a hazard and for drivers to slow down and proceed with caution. Green arrow. A lit green arrow indicates the turn a driver is allowed to go. Yellow arrow. A red arrow will appear any second. If you are not already at the intersection, stop. Red arrow. No proceeding in the direction signified by the arrow. Who has the right of way at intersections where traffic lights are non-existent, not working, or malfunctioning? 2-way stop. In a 2-way stop situation, only one street on two intersecting streets has stop signs. The street without stop signs is a through street and has the right of way. 4-way stop. 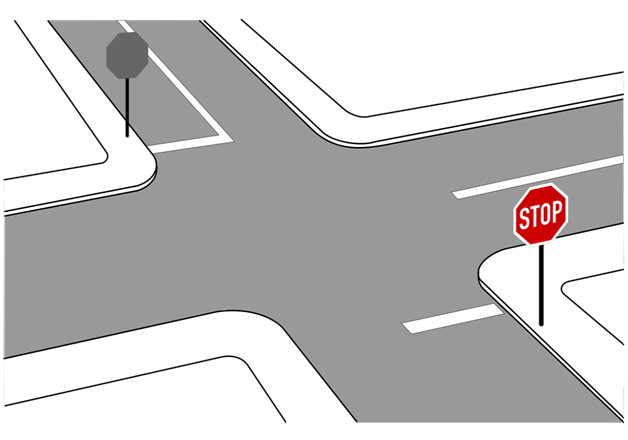 In a 4-way stop scenario, drivers must yield the right of way to whoever reaches the intersection first. In case two or more vehicles arrive at the intersection at the same time, the driver on the left yields the right of way to the vehicle on the right. Drivers turning left. Yield to all incoming traffic, except when you are already at the intersection and have started to make the turn. Pedestrians. At all times, under any condition, pedestrians have the right of way at crosswalks and intersections. Be particularly mindful of the elderly, children, and blind pedestrians. You must come to a complete stop and let them safely pass. Roundabout or rotary island. Yield to vehicles already within the roundabout. Keep right and watch out for directional signs. Stop sign. Stop, yield to whoever has the right of way, and proceed only when safe. Yield sign. Slow down, and stop if necessary, and give the right of way to traffic on the through road. You may proceed without stopping if the through road is clear of pedestrians, vehicles, or cyclists. Stop line. Stop lines are pavement markings that vehicles must not cross while waiting at an intersection. Crosswalk. The crosswalk is a section of the road exclusively for crossing pedestrians. Stop just before a crosswalk if no stop line is visible. Unmarked crosswalk. If a crosswalk is unmarked, stop where you usually would at a marked crosswalk. A driver’s permit is a prerequisite to a driver’s license, and all teenage drivers 15 and above must pass the Colorado driver’s permit test to obtain one. 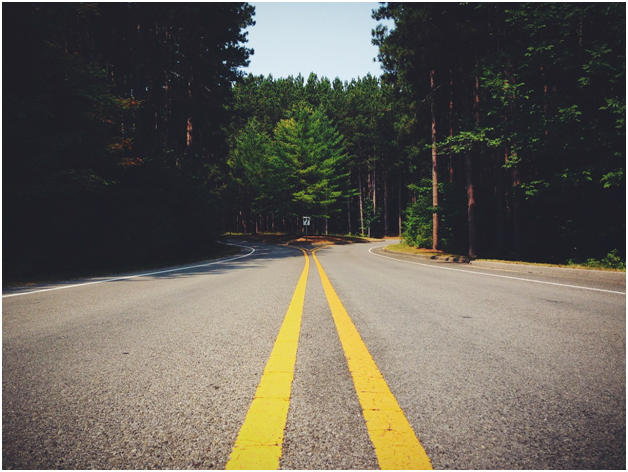 Study the above pointers about intersections and right-of-way rules to increase your chances of acing the exam. For more questions about the driver’s permit and the education required to qualify for one, or if you want to enroll in any of our expert-facilitated driving courses, please give us a call.